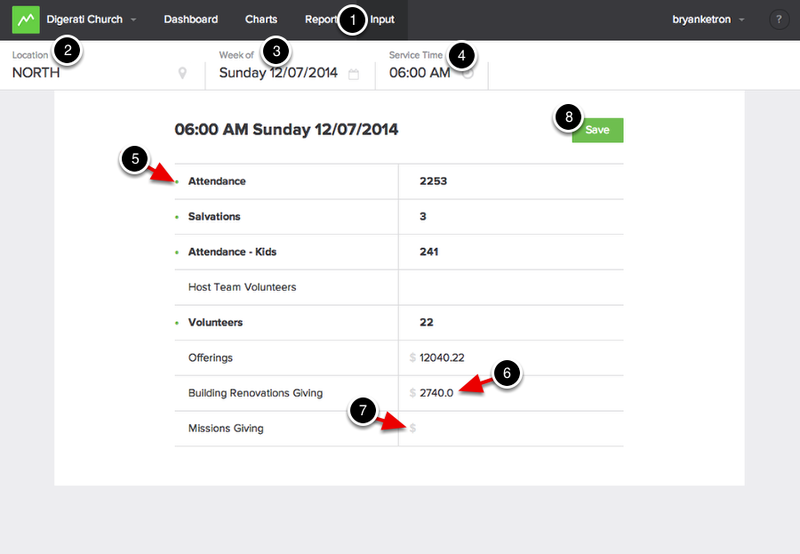 To begin inputting data, select "Input" from the navigation at the top of the page. Select the location you want to enter data for. Select the week you want to enter data for. If you have created a midweek service time and set it to "After Sunday," select the Sunday prior to it to record the data appropriately. Select the service time you would like to enter data. When you are entering new data, the data will be bold and a green dot will appear next to the data. This indicates that the data has yet to be saved. If the data is not bold and has no green dot, that data has been saved. For all currency data, a currency marker will appear. Be sure to always save your data. Once you save your data, the "Saved" icon will appear. The green dot will also no longer display.